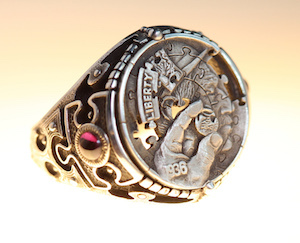 Scottsdale, AZ—Designers Michelle Berlinger, Evgenii Fedko, and Aleksey Saburov—all winners of the 2019 Centurion Emerging Designer Competition—made their debut to the American jewelry trade at the just-concluded Centurion Scottsdale show. Since 2007, the Centurion Emerging Designer Competition each year gives three up-and-coming designers an opportunity to launch their line in front of an exclusive audience of American luxury jewelers.The annual Competition, sponsored by Stuller, attracts the best rising talents in U.S. jewelry design as well as renowned jewelry designers from around the world, to vie for one of three coveted spaces at the Centurion Scottsdale Show. 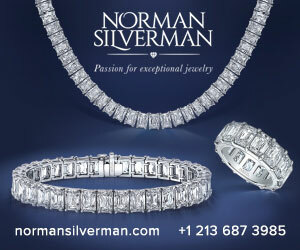 The competition is open only to designers that have never before shown at a U.S. fine jewelry trade show before. This year’s competition drew more than 85 entries from around the world, and the Centurion Retailer Advisory Board votes for the final winners every year. Centurion president Howard Hauben said, "Every year Centurion brings together the top prestige jewelers in the United States with an outstanding collection of high-end manufacturers. We're proud to also introduce such a high level of innovative new talent that adds to our tradition of bringing the best retailers and designers together under one roof." In addition to their free exhibit space at the Centurion Show, the three winners also each received a $1,000 merchandise certificate from Stuller. Michelle Berlinger is the designer and founder of Berlinger Jewelry. Her career as a jewelry designer began at a young age when, at 13, she broke her back competing as an elite level gymnast. While bedridden and recuperating, she learned to make jewelry. An early entrepreneur, she quickly began selling designs around her hometown of Los Angeles, CA. She came east to attend Dartmouth College, where she studied the intersection of jewelry design and sociology, becoming the college's resource for gifts and engagement rings. Her first collection symbolized women’s rights: from hand-tooled leather armor to suffragette-inspired rings, her pieces were totems of strength in a world often harmful toward female bodies. 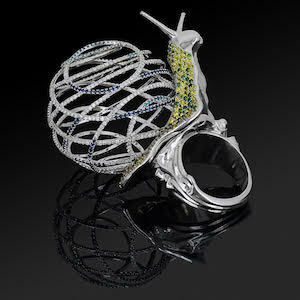 As an artist, Berlinger recognized that jewelry was and is a powerful symbol that could symbolize love and empowerment. With this in mind, she founded Berlinger Jewelry after seeing an opportunity in the industry to use wedding and engagement rings to speak out about individuality, equality, and empowerment. 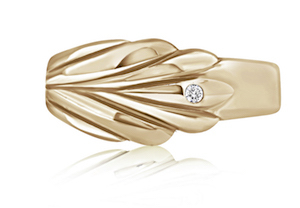 Berlinger Jewelry grew out of the desire to rethink the age-old engagement ring tradition. 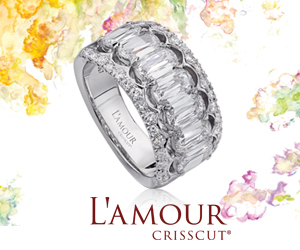 The brand believes both men and women should proudly wear diamond rings, and provides couples of every gender with symbols they'll cherish forever. In addition to traditional engagement rings, Berlinger crafts original male/masculine-focused diamond rings, offering both the LGBTQ and heterosexual communities more universal engagement ring design. The Berlinger aesthetic is a union of modern design and old-world artistry, marrying geometric designs with Art Deco aesthetic. 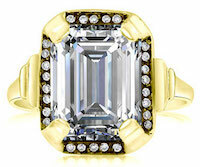 Yellow gold ring with emerald cut diamond center, left; "Hemmingway" rose gold and diamond ring, right. "Truly love what you do and never stop honing your craft," says Evgenii Fedko. It’s how he got into jewelry arts. 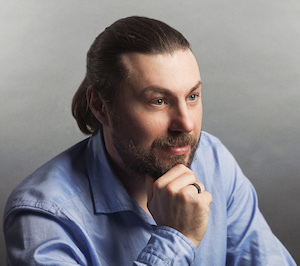 Fedko, a native of Sochi, Russia (where the 2014 winter Olympics were held) left a successful business career to pursue his passion for creating jewelry. As an entrepreneur, Fedko’s business career first began with commercial alpine climbing, then expanded into hotel ownership in Sochi. As his businesses grew rapidly, he added a restaurant, too, but throughout those endeavors he still felt somewhat bored by business and wanted to be involved in the arts. 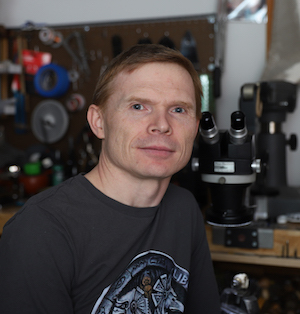 Inspired by his wife, Katherine, an artist and a professional designer, Fedko began his pursuit of jewelry arts and got an education in decorative metalwork from world-renowned craftsmen Jura Diasetter and Sergej Manaenko at the GRS training center in Kansas. In the course of four years, the Fedkos’ jewelry business expanded into a full-size production studio, won a series of highly prestigious European awards, and built a loyal, consistent clientele. They expanded their business in the United States just this year. Gem-studded rings inspired by nature, left, and snail ring, right. How realistic is it to completely switch gears and leave a successful business career in favor of personal art? Fedko points to himself as an example of how self-confidence, persistence, and love for work is the stuff dreams are made of. Aleksey Saburov is a Russian-born, New Jersey-based designer who is world-renowned in the art of creating “hobo-nickels,” a niche art form of creatively altering small coins. He makes 21st century "hobo coins" as unique works of art, micro-engraved on authentic nickels from the early 1900's. Miniature fine carving is Aleksey Saburov's specialty. He learned his craft at the prestigious School of Decorative Metal Processing in Krasnoe-On-Volga, a township in the European part of Russia. He holds the title of master-engraver of the 6th Craftsmanship degree, a five-year diploma and the highest category awarded. 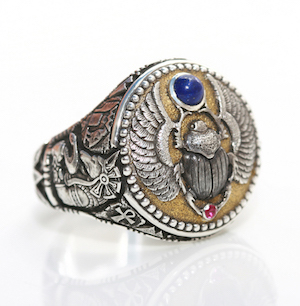 "Puzzle" ring, left, and "Scarab" ring, right. Saburov has been working in the high-end professional jewelry industry for over 25 years, forging partnerships with luxury jewelry, knife, and watch brands such as the Corum Swiss Watches, Scott Kay Jewelry, and William Henry knives. Since 2013 he has owned the Saburov Art Studio in New Jersey. Throughout their lives, people constantly seek to capture moments and memories through the snap of a camera: portraits of loved ones, memorable moments of traveling, and other memories. Instead of adding those to a photo album, what Saburov does is create a dimensional, engraved coin that allows the owner to actually feel the memory as a miniature sculpture, all done by hand.